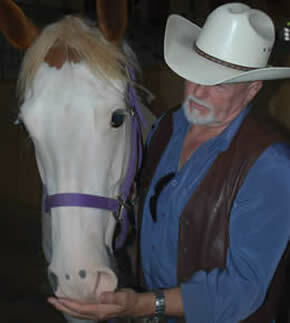 The Equine Touch was founded by Jock (John) Ruddock who passed away in November 2011. Jock was a former Scotland Yard Police Officer who spent 28 years of an eclectic life as an international professional wrestler, entertainment director, hotel manager, song writer, show writer, record producer and part time bodyworker. On retiring from the ring he turned to the world of complementary health qualifying as a clinical hypnotherapist before opening five successful bodywork clinics in his native Scotland. During his 28 years as a globe-trotting wrestler he learned practical chiropractic and osteopathic manipulations from his fellow matmen in New Zealand, Australia, USA, Hawaii and Japan and earned himself a reputation as a ‘bone setter’; the laws of the wrestling world being ‘if you hurt me, fix me’. Jock formally trained in Aikido, Dynamic Ki, Hyperton-X, Kinesiology, Bowen and Isogai. His first steps into the world of teaching was as an unarmed combat instructor in the Police. Later he taught street kids in Auckland, New Zealand the art of cabaret and stagecraft before moving to Australia where among his private pupils was the international recording star Natalie Imbruglia. In 1981 he was presented to Her Majesty Queen Elizabeth aboard the Royal Yacht Britannia for his services to entertainment. In 1997 Jock began to research, develop and choreograph a complete new modality partially based upon the principles of bodywork as pioneered by Dub Leigh, Lauren Berry and Tom Bowen. He discovered that by vibrating the muscles in a certain sequence and at specific points in the body using his own Aikido based move, the entire body could be induced to slip into a state of medical chaotic confusion and at the same time, relaxation. The syndrome is something similar to an entire orchestra tuning up prior to a concert and then settling down as an in tune symphonia. Out of this cellular and holistic confusion and what is now termed as medical chaos, order emerges and within the body homeostasis is attained. After considerable studying and fine-tuning of this new approach, Jock decided to name it The Vibromuscular Harmonization Technique (VHT). In 1997 transposing the fundamentals of his unique VHT technique he began to work professionally as an Equine Bodyworker on horses. From a simple beginning at a stable in Aberdeen Scotland the Equine Touch has now grown to a complete Equine Bodywork modality, used by horse owners and equine professionals worldwide. The ET can be found to be effective on equines of all kinds, from log pulling horses in Norway to event horses in the south of New Zealand. Always travelling and always teaching, Jock had his vision – to be able to help as many horse as possible. Together with Ivana, they created The Equine Touch Foundation, trained their ET Instructors in many countries thus making Equine Touch available to all interested students. Students can now enroll into the classes in Scotland, England, Ireland and Wales; Norway, Sweden, Denmark, Holland, Germany, Spain, Slovakia, Czech Republic, Zimbabwe, Zambia, South Africa, USA and Hawaii, New Zealand, Australia and Canada. Ivana is a qualified veterinary surgeon and former university lecturer in anatomy from the Czech Republic. As the Director of Education, Ivana brings with her to the Equine Touch an eclectic wealth of training and knowledge from the orthodox veterinary world, as well as her interest in other holistic modalities – homeopathy, acupuncture and nutrition. 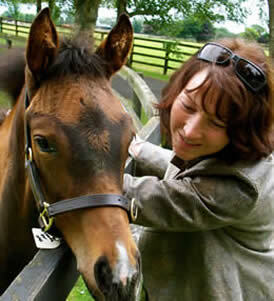 Ivana first studied the Equine Touch in 1999 with Jock and after they married, partnered him worldwide in the research, development and teaching of this unique discipline. Ivana’s teaching technique has been described as enthusiastically brilliant and totally professional. A consummate researcher and instructor she leaves no answerable question unanswered with her outstanding knowledge of allopathic, energy and many other practical healing techniques created for the equine and small animal. Her understanding of the horse, its requirements and the ‘Equine Elements of Influence’© which have an effect upon its health and well-being have impressed not only her students but equine professionals worldwide. Uncompromising in her search for, not only the latest developments in horse care, but also the truth behind them, her Level 3 lectures on ‘The Equine Elements of Influence©’: saddles, teeth, feet, rider, training, nutrition and environment, backed up with a detailed power point presentation, have been described as ‘inspiring, brilliant and information filled’. Ivana’s wholehearted commitment to improving the standard of life for the horse has earned her respect, not only as a practitioner and instructor but as a guide to all horse lovers wishing to provide a better quality of life for their horses. Ivana’s knowledge of anatomy triggered a public demand to hold Equine Dissection Clinics. Her Whole Horse Dissection is giving her students, who range through Equine Touch Practitioners, body workers, vets, trainers and even artists, the “big”picture of what is under the horses skin. Seeing the continuity of the fascia, observing the functional muscle chains of the horse opens eyes and broadens understanding of how the horse’s body works. This also helps to understand the effectiveness of different modalities and of their impact on the horse. Following the unique success that the Equine Touch was achieving when applied to other animals, Ivana researched and developed a gentle non-invasive modality exclusively for dogs (The Canine Touch©), by taking the distinctive ET move, and adapting it solely for the dog. Practical Canine Touch classes are now taught to students in two, two day seminars internationally. Her book and accompanying DVD ‘The Canine Touch©’ (available through Equine Touch Instructors and National Coordination Centers) has been acclaimed by vets, dog handlers and trainers as a valuable and comprehensive piece of work.